It's 20 years since Windows 95 changed the world. Can Windows 10 do the same? In August 1995 my friend Nathan and I sat in his living room with his PC on the dining table and a huge number of floppy disks and installed Windows 96. After Doom, this was the most significant thing that happened to me in computing terms for a long time. It was significant for Microsoft too because while it was still the dominant player in computing software Apple's Mac was gaining ground and winning people over in terms of simplicity. So to make sure the launch was a big success Microsoft spent a lot of money globally on advertising. In the UK it did some massive buyout of The Times for a day, featuring a colourful Windows 95 supplement. In some ways Windows 10 is more significant for Microsoft. It's the first time the company has given away a major update like this. 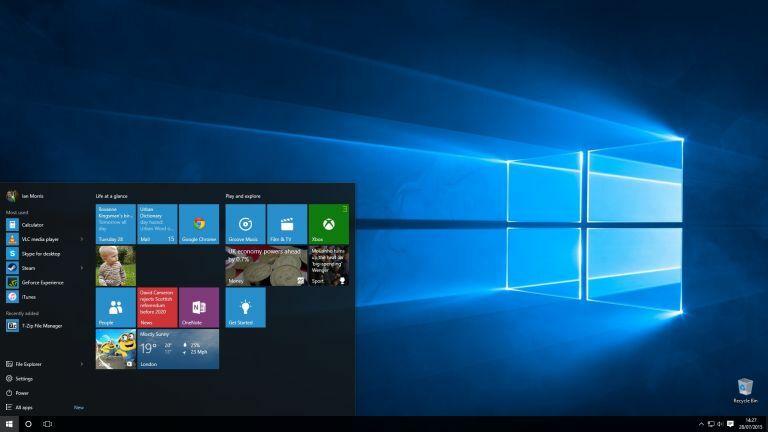 Windows 10 is also the product of those grumbles from consumers about the Windows 8 user interface. I personally didn't have a problem with the full-screen affair. Even on my home desktop I found it reasonable to use. There was a lot of moaning though, because people don't like change. Really though, Microsoft should always have understood that giving people a choice was preferable to forcing everyone to use the same tablet-style OS. What the company did here was utterly destroy the underlying strengths of the new operating system. Don't forget that the UI is just one piece of what's going on with an OS, and Windows 8 brought with it plenty of great new features that actually moved along the platform substantially. The same is true for Windows 10 too, but this time Microsoft has, for the most part, managed to avoid any controversy. Some people are in early whinging about how it forces updates on users. The fact is, for most people this is a good and worthwhile safety measure. Sure, once again it would be good for advanced users to be able to turn off updates, but you need one of the more advanced editions like Pro or Enterprise to do that. For me though Windows 10 is just about ideal. I've been using it on my desktop machine since the pre-release test got usable - and some of the time when it really wasn't. I watched it start off well, go through a really very rough phase and then emerge last week in version 10240 as something that feels almost completely finished. For one thing the constant bluescreens have gone now, and the OS feels totally ready for its launch. Visually, it's stylish low-key and everything Windows 8 could have been. There are some good changes to the underlying code too. DirectX, for example, will get a massive performance boost under Windows 10 which will make gaming on a PC even more attractive. But there's one other crucial thing to remember about Windows 10 - it's supposed to bring Microsoft together. Xbox, Windows Phone and PCs will all be running versions of this OS with the same underlying kernel. The idea is that developers can produce apps that run on all three platforms. The company, for example, wants Office on your phone to work like Office on your PC. You can connect a keyboard, monitor and mouse and the untrained eye won't be able to tell that it's running on a phone. Some of this won't affect regular users in the slightest, but Windows 10 is free, and Microsoft wants to get everyone off the older versions ASAP. If you ask me I'd recommend it in a heartbeat, it's Microsoft at its very best and easily the update everyone has been waiting for. Will Windows 10 change the world? Sadly, we're probably a bit past that now. Computers are declining popularity and fewer are sold each year. That said, Windows 10 might help you fall back in love with your computer again after the Windows 8 years. And best of all, you can just download Windows via the internet now. No more sitting around for hours swapping floppy disks around as Nathan and I did 20 years ago. Now why not check out our guides to the best Windows 10 features and the best Windows 10 laptops, tablets and 2 in 1s?